Cheeky chappie Jack is being rehomed due to his owner's ill health and inability to walk him on a regular basis. This is causing Jack to be very restless in the home and he has now taken to barking at dogs who walk past the window and being very OTT when visitors arrive at the house. 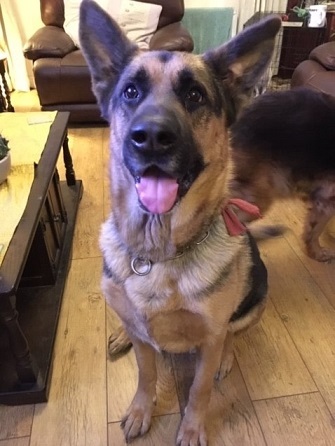 Our volunteer found Jack in a crate in the hall, he was vocal but once he had calmed he was allowed into the lounge and Jack was found to be a friendly boy who loves to give kisses. Therefore going forward Jack will definitely need more work on accepting folk into the house. Apparently, the reason Jack is crated is has learnt to open doors and if visitors arrived previously he would open the door and let himself in, whether you wanted him or not. Jack lives happily with another dog but outside he can be vocal. Our volunteer took Jack out for a walk and although strong on lead, felt he was manageable, we are told he is vocal when seeing other dogs but he didn't seem overly upset when he saw dogs (again a bit more training and socialisation should sort).